Earn up to 7,500 reward points. An affordable, versatile and unique shell pack that will help expand your creativity and tonal possibilities. The key component of the Superstar Hyper-Drive Duo 5-piece shell pack is the 14x10” snare drum, which is called the Duo Snare. 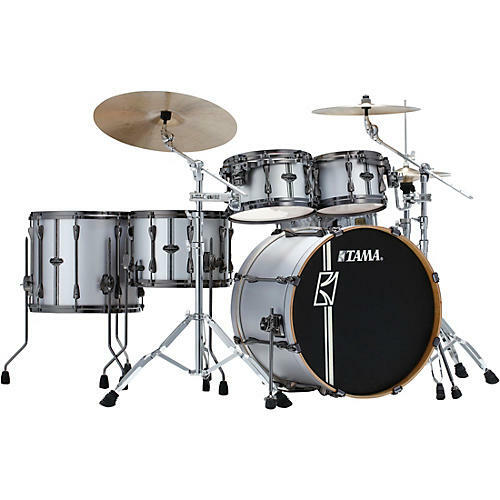 This drum is unique not only because of its uncommon 10” depth, but also because it is equipped with floor tom legs and brackets. You can tune this drum low and place it where the first floor tom would traditionally go. As such, the snare can function as a low/deep snare with the snare wires engaged, or as a 14” floor tom with the snares off. This can lead to many unique phrasing opportunities. Once you experience playing on this new kit your eyes and ears will be opened to the infinite range of possibilities, plus it’s a lot of fun. Just try it.